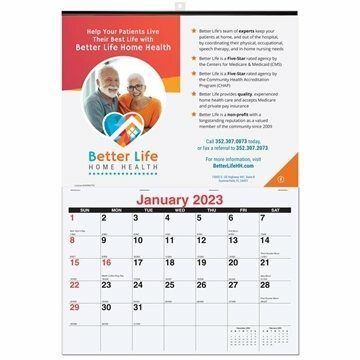 Size 12" x 17 3/8" custom single image 12-month wall calendar (January-December). Submit your own custom photo or artwork for an attractive and highly personalized promo. Image is printed one to full color on gloss cover. Calendar pad is printed in black and red ink only on brite white offset and includes American holidays, moon phases and Julian dates. Last sheet features two years on a page. Calendar pad stapled to bottom of image sheet with black tin at top and hanger. this is a quality product at a reasonable price. We are very happy with our purchase. seems to be a quality product for a reasonable price. Haven't used these yet but the imprint looks great. My boss was very impressed with the quality and also the promptness involved with taking care of our order. All participants at our Conference loved their gift! I cannot say enough good things about AnyPromo. I will buy from them again, no doubt.